While in Tajikistan, I slept out in the open one night. Problem was that it was dark when I put my sleeping mat down. 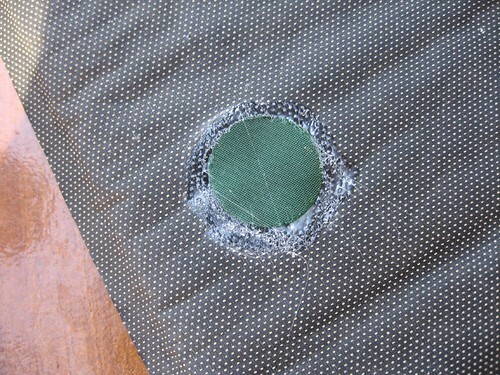 In the morning I pulled out two big thorns from the mat, leaving some nice punctures. 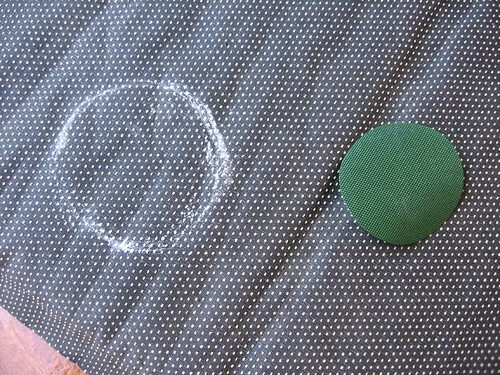 Mark the puncture with a circle slightly larger than the patch. 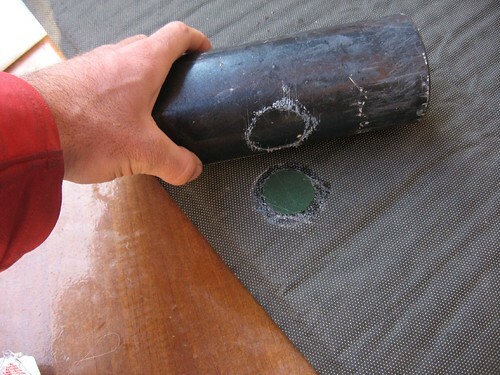 You may need to put the fully inflated mat into a sink full of water in order to find the leak (look for bubbles). Chuck the hot bond in boiling water for three minutes. Remove the hot bod from the water, rip it open, and apply it to the thermarest, kneading it into the fabric with the applicator. Then put the patch onto the glue. You have about 45 seconds when it is cold in order to get the glue applied and the patch on. 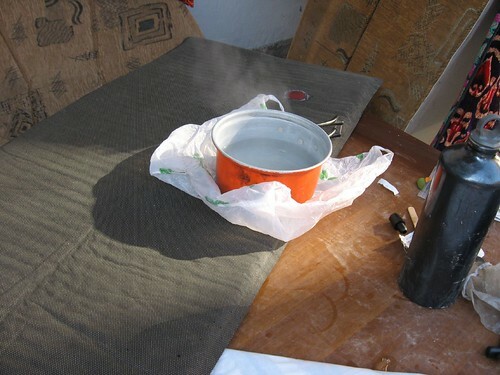 Put a plastic bag over the patch and glue, and then place the pot of boiled water on top for 60 seconds. 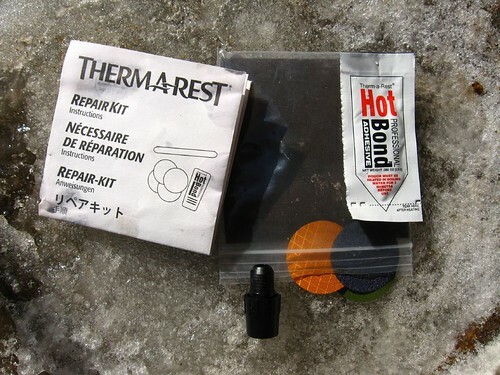 According to the instructions, the hot pot will not damage your thermarest if the valve is open. 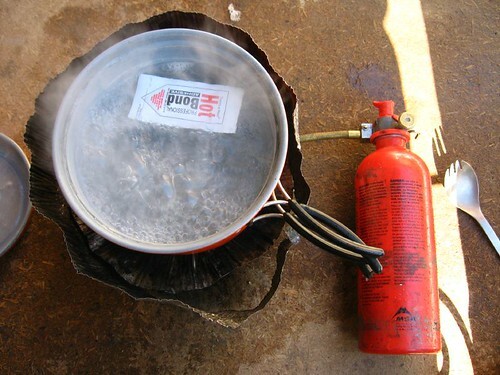 Remove the pot and immediately roll over the patch a few times with a cyclindrical object such as a metal water bottle (you can easily peel the hardened glue off the bottle afterwards). Leave the thermarest undisturbed for 10 minutes. The mat is now ready for use. Very informative, was wondering how to do that repair for ages myself. Always nice to see it all in action…. Keep out a harms way and have bought new biscuits due to fact that I ate all the ones we had in the tin. As you do. Can't go without bickies. You amaze me Rob. Such great repairing skill. Hope it holds up! Mum, I must have another hole somewhere though. The mat still goes down after about 10 minutes. Not so good when the ground you're sleeping on is frozen! Rob. Sleep underwater – thenlook for bubbles. hats where the other hole in your poofter pad is. easy. good to see the MSR is holding up. yay. Kep on enjoying things over there. I blew my mat up till it was the size of a giantic beach ball, you can hear the air escape and everything… only snag it made all the foam (54it) move and it was never the same again, now I just sleep on bits of carboard p155 stained dosser style.